Breathing in Grace: A Lover of Owls!!! I don't know when it started....but it was YEARS ago, even before Pappy and I got married and that's been over 35 years ago!!! They've become really popular in the last few years....have y'all noticed?!?!? ;-) Well, I have....and I can't help but think that God is just smiling all over me when I see them and especially when I have sweet friends think of me when they see one!!! My precious friend, Ms. Dawn and I met for lunch yesterday. We only get to do that, maybe 4 times a year, but we talk to each other via e-mail and text every week. Anyway, we always meet at Ruby Tuesday and have the salad bar...but yesterday, we both splurged on something bigger and better and came out of there stuffed to the gills....and both swearing that today is "D" day, if y'all catch my drift!!! Anyway....this little owlie is what she brought me. Here's the thing....besides the fact that I love owls....it's hard to tell in this picture, but his/her wings and the handle is a deep purple. Now....does everybody remember what my favorite color is?!?!? And....I was just thinking one day this week that I want to incorporate purple somehow in my kitchen. Little did I know that all I had to do was sit this little sweetheart on my window sill and voila....a touch of purple in my kitchen!!! Thank you, Lord, for sweet friends!!! Ms. Dawn....HOPE you know how much you're loved!!! God brought us together oh so many years ago, because of a prayer He answered for you! I'm still reaping the benefits of that prayer....and I don't mean just in little gifts from your heart....I mean the blessing of your friendship!!! 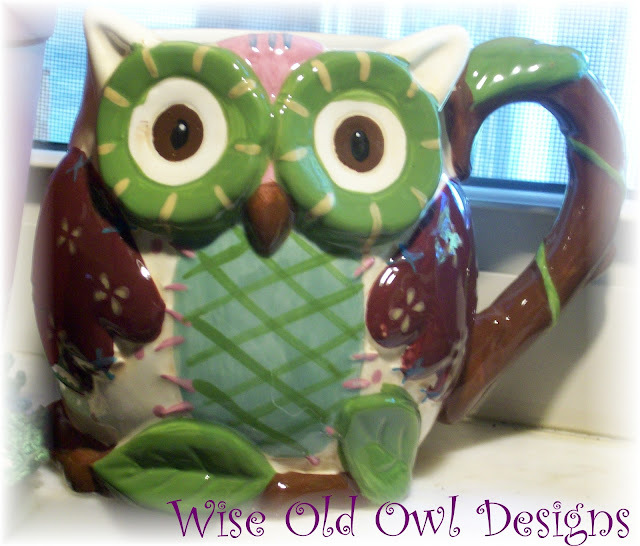 I have a LOT of owls in my Artfire shop. If you listen...you can hear them! I became fascinated with owls in the 2nd grade. My first book report was on owls and I can still picture the snowy owl I drew on the cover. So sweet! I like your story and this uil is wonderful. A friend whooooooo gives owls. Cool!